and I'm for a bridge ~Mon Bridge ( Mengchao / Dream Bridge ). Came all came to the Thai and Burmese border of Sangkhlaburi is for a bridge. Mon Bridge is the longest wooden bridge in Thailand, and someone has taken a very Sanmao name for it, called "Dream bridge"; photos searched online in the thick fog the wooden bridge loomed across the strait, indeed like a dream. 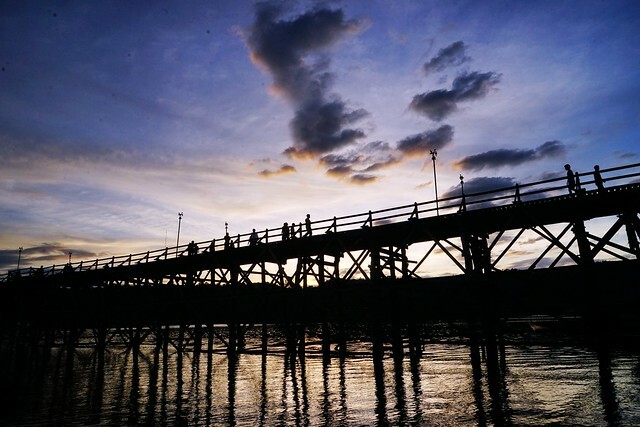 "Dream" and "mon" homophonic, this wooden bridge is known as Mon Bridge, the official name is said to be Uttamanusorn bridge. 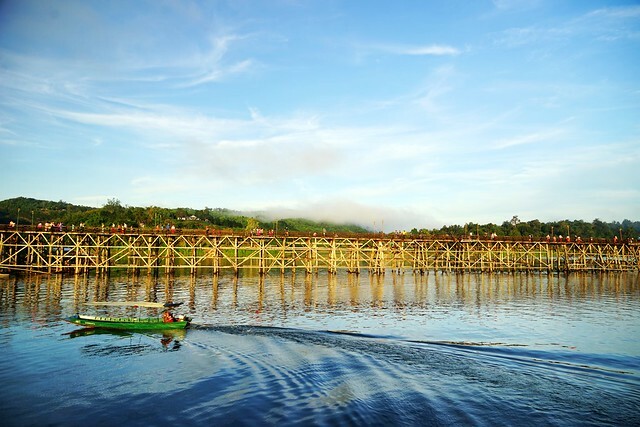 Mon Bridge, which connects the town, is the longest wooden bridge in Thailand and the second longest wooden bridge in the world, and is the Mon Road in the mountains, built in the 1978 years, about a total length of about a metre, Use wood, all created by hand. What we are seeing now is the new bridge, the year of the Mengchao, the bridge was washed off by the Flood, and later in the date of the month to complete the completion of the day, in order to contact the cross-Strait exchanges, During that time, there was a zhuqiao on the lake, and now the part is placed under the bridge, the place up and down the boat. As more and more films are filmed here, more and more tourists are coming here, feeling that serenity and simplicity are fading away; friends who listen to Bangkok say it is a secret mecca for the small travel of Bangkok residents. It takes at least six hours by car from Bangkok, and the second half of the road is still winding mountain road, fortunately, the road conditions are quite good, even more smooth than the road in Taiwan's mountainous areas, it is very suitable for everyone to travel here, but if you choose to ride the public transport, it may take longer, about a full day of traffic time First from the North bus stop in Bangkok to Kanchanaburi, and then to Sangkhlaburi, will definitely be the day before dawn, arrival is the hard ride of dark, and because of this, Most of the travelers who come here will be dominated by self-driving cars. Before mentioning the upcoming visit to Sangkhlaburi with another newly known Thai friend, I didn't expect him to say it immediately,Paradiso ( Heaven ) ... ; Wow!! Is there such an exaggeration? Huanlai in the hearts of some people, this Thai-Burmese town, unexpectedly is so beautiful, with " Heaven " to describe, but really let oneself look forward to it! This journey is a lazy and dazed route, with the people of Bangkok two days and one night, or even the day round trip is very different way; I spent three days and two nights, although not as expected to book out of the window can directly see the Dream Bridge restaurant, but fortunately not far from the wooden bridge, stay, has long gone through the dream bridge how many times; This should be a bridge to the maximum number of times, except for Prague's Charles Bridge. Perhaps I will not use heaven to describe this place, but here is really a simple town, to be precise, is a simple is about to move towards the outside world in line with the small town. Seriously, this dream bridge is really the more beautiful, I do not know why with a magic, let people turn away, began to miss. In the early morning and dusk, it is the most beautiful and lively time, after 10 o'clock, three o'clock, do not know whether because of too hot relations, there are often no people on the bridge, the moment will let me think this town is no one empty city? Dream Bridge (Mon Bridge) itself has been quite beautiful, enough to let the shutter press non-stop, from different angles are not the same, different times also make people feel different; there are also some people, things, stories on the bridge are quite wonderful, stay a little more time, You will be able to learn more about the local people and life. Early morning can not miss the activities, the morning from the Buddha Rim, in Thailand has not known how many places in the morning to start the Buddha rim, but here, absolutely unforgettable. Weekend town poured into a lot of Thai tourists, waiting for the team to grow to no end, looking at the Huayuan monks and the people of giving, feel very much like the appearance of filming, feel quite commercial appearance, can not help but let themselves suspect that this is a pious faith? Or is it a business? Chatting with the local young people, who lived on the main street, also felt that the morning Busch was quite commercial, and I asked him: Was that the case before? He said it wasn't, it only turned out like this about four years ago ....... He told me, with a picture he had taken, that there were monks and local residents Huayuan, and that morning I saw those packaged items, those who were local residents one or two months, who would take the temples to the monks, and in the morning, just to the rice, and would not give them. From the camera, is beautiful, even from the point of view of participants, change through the traditional costumes, feel the traditional monk Huayuan, this is also a very memorable experience Ah!! Perhaps he has seen too many monks in Thailand Huayuan, from Bangkok, Big city, Ampawa, Ching Kang ..... And so on; did not see such a lively scene, the feeling has become an established companion itinerary, a daily morning must complete the homework, even the work, always feel less primitive original intention, less some faith of piety. This really with their own impression of the Huayuan and Busch is very different, you can only tell yourself, because the giver is too many, so, can only maintain such a rhythm! 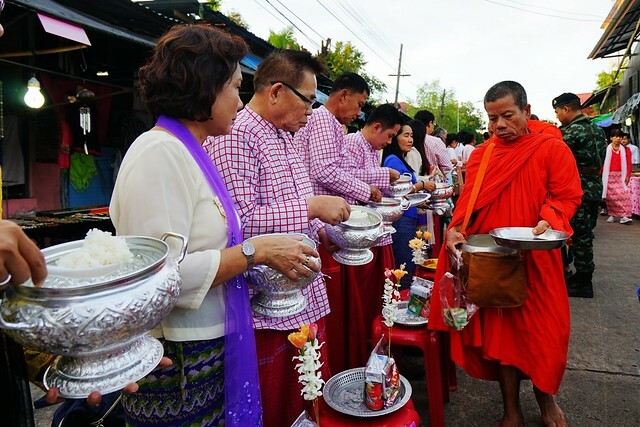 Well ~~~ a bit of a shock experience, perhaps not enough to understand the local culture, have the opportunity to go to the Friends of Sangkhlaburi , do not miss the Thai monk Dervish Huayuan (Nimonka) Traditional culture; In the morning with the Buddha bond. A boat ride to see the famous local monuments is a journey to Sangkhlaburi , which must not be missed; passing at both ends of the dream Bridge, someone will ask from time to time if they want to take a boat, some of the board has a clear price to write, and some only go to the place, but do not indicate the price. Seriously, I don't understand how the cost of the boat is calculated, thanks to the consultation of the traveling companion Arya, who said that in Thai she let a ship from the Thai baht, the bargain into a Thai baht, a ship that could carry 8~10 people, The cost of such a package is actually very cheap. It takes about one hours to take a boat to visit the monuments, mainly to see Wat Tai Nam วัดใต้น้ำ Water Temple, วัดสมเด็จ ( เก่า );Wat Tai Nam ( วัดใต้น้ำ ), literally the temple at the bottom of the water, is a Meng temple built in 1955 years, in 1983 years in order to build Vajiralongkorn Reservoir, in addition to the drowning of temples, even the entire Mengcun (Mon Village) was submerged, so many Mon residents migrated to the present near Monsanto. Water Temple (Wat Tai nam/ วัดใต้น้ำ ) It is a must-see attraction in the local area, and it is only in your own experience that you know the factors that need to be taken into account when you travel. As we drove the ship, the boatman parked the boat in a place, pointing to the yellow flag position and saying that the temple was under the water ...the lake beneath the flag at hand was completely invisible, How is it necessary to imagine that the temple in the water is completely submerged under the underwater, and it is impossible to determine whether it exists and has not seen it? Later asked the locals, only to know that every April or May to have a chance to see the temple out of the water, people feel a little sorry, but it is such a regret, will make people want to visit again. And then came วัดสมเด็จ ( เก่า ) , it seems to have become an abandoned desert island, and when the boat docked, a small friend helped pull the boat to dock, should be to earn some tips; curious not to know if they had gone to school? Later asked later to know, the original local children only go to school for two days a week, other time is in the work to earn tuition. The natural ladder in front of us, going up is our destination, วัดสมเด็จ ( เก่า ); The ladder is not hard to walk, but some are broken, Along the same level, they are thinking, do not know what will be seen? It turned out to be a temple. Like abandoned in general, the walls of the quartet is not complete, around half a circle, the other side is the main entrance of the temple, surrounded by shade is also covered, the atmosphere is very good, the carving on the door is still clearly visible, there are still Buddha statues and incense, into the inside, surprised this temple even the ceiling is gone; How will the Buddha statue shelter the wind from the rain? In the boat, he was a dazzling golden tower to not, although the ship is not close to the shore, but the towering and glittering,Brilli Brilli Tower, let people not notice it? After the inquiry learned that it turned out to be the local Golden Pagoda, built in 1982 years. When we arrived at the parking lot in the vehicle, we did have a few seconds to be shocked by this huge look, my God!! It's too ..... ... It's big!! 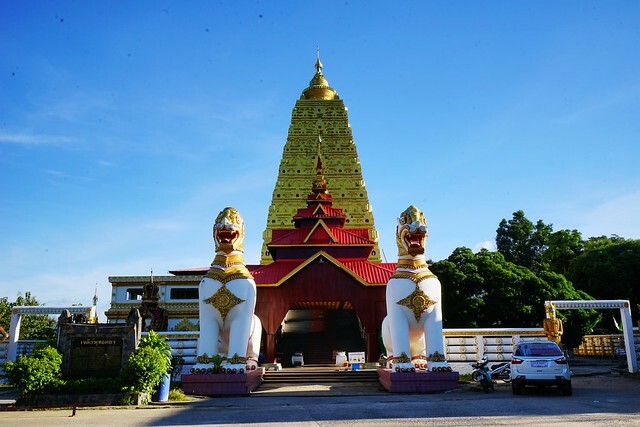 I did not expect, in such a Thai-Myanmar border town, there is such a large pagoda Ah!!! I don't think this form of architecture seems so much like Thailand, especially the two saints in front of the door, the chinthe , and the design of the red roof, which feels so much like Burma? Or because it's a small town on the border between Thailand and Burma, the style of the pagoda is built from the beliefs of two countries. nearby Mon Temple less than a kilometer from the Golden Pagoda (Wat Wang wiwekaram/ วัดวังก์วิเวการาม ) but the focus of the local people's faith, this is the morning boat completely invisible Water Temple (Wat Tai Nam/ วัดใต้น้ำ ) New temple, which was moved here as a result of the construction of the reservoir; the Golden Pagoda Chedi Phutthakhaya , which we have just seen, is said to belong to a part of the Mon Temple and was deliberately built on the edge of the water. 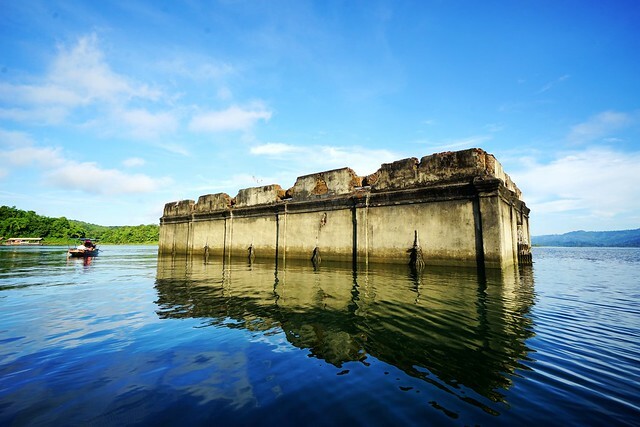 1979 Thai Government builds Vajiralongkorn dam ( เขื่อนวชิราลงกรณ ) , had to flood the Mon settlement, when the people back and forth coordinated is LONGBO, led everyone in the construction of the dam at the same time to set up to build Mengchao, this memory is quite profound to the local people of Meng. The locals I met in town selling postcards mentioned that he had been forced to move to the village since he was a child, and that he had moved to Mon Bridge ...... This is the most important faith center in the village, the most lively time of the year is when the festival is held, the festival, the site by people carrying water pipes, in all directions of the cohesion will fill the waters, and finally to the monk's body; and there is a scene where residents kneel on the ground, monks ( monks )step over their backs and go forward .....( This event is for boys only ), although not involved in the holy situation, but in the temple of the corridor can be seen in the brilliant photos. 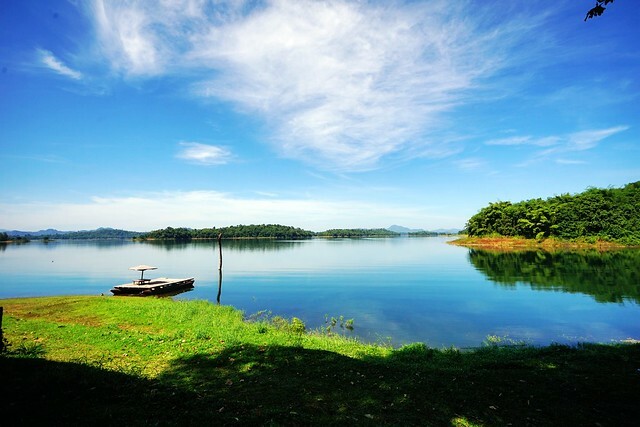 There are great camping areas, as well as a number of holiday cabins, as well as a restaurant,This is really a lake, beautiful to make people want to visit again. after buying the tickets, the car went down a small road and headed for the lake, God!! The scenery in front of us is so beautiful, so beautiful, so quiet; Shake down the window, you can hear the birds barking, the breeze blowing through the sound of the woods .... In this way, I was in front of the turf, Blue Sky, lake and forest to attract, here is also too beautiful!! Originally Pom Pee view point (จุดชมวิวป้อมปี่ ) is located in Khao Laem National Park in the area, we have this piece of Khao Laem Lake, which is the middle and upper reaches of the Vajiralongkorn Dam Reservoir and is operated and managed by Khao Laem National Park, There are restaurants, cabins, camps, water ramps, barbecue areas .... such as The camp equipment is quite perfect, I have to go to the bathroom is also very clean, I walk along the lake, touch the breeze is so comfortable, the surrounding environment is so quiet, you can hear the birds barking, the wind blowing through the sound of the leaves, but also can hear the fish flying in the lake to shoot the surface of the water, really can see the fish jump up; I can finally feel the Paradiso ( Heaven )in the mouth of a Thai friend. Instantly let people feel that Sangkhlaburi is Paradiso. Today happened to meet such a beautiful place, here only met the people who speak Thai,It feels like a private spot for locals. After asking the staff, only to know that the sunset here is very beautiful, very beautiful;I thought I would come and live here next time, before I have a chance to see the beautiful sunset! Use here to say goodbye to Sangkhlaburi,It's so .... . Wonderful, too .... it's happy.